Wow! … When I was first introduced to this juicer, I was smitten! If anyone could be smitten with a juicer, I was! 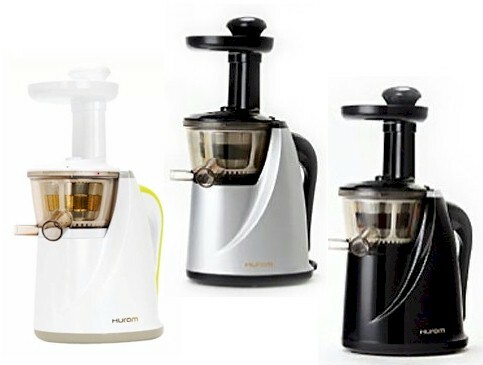 Knowing that this Hurom Slow Juicer came from the same manufacturer as the original gear juicer manufacturer in Korea, it instantly captured my attention due to their proven track record. 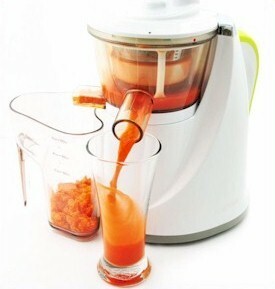 This juicer is very similar to the Omega VERT VRT330 with very slight variation. Both come from the same manufacturing plant in Korea but are being marketed under different brands. So when choosing whether to buy an Omega VRT330 or a Hurom Slow Juicer, it’s really just about choosing between the brand name and pricing. It shouldn’t be a very difficult decision, but on this site I will talk about both models. How Does the Hurom Slow Juicer Work? 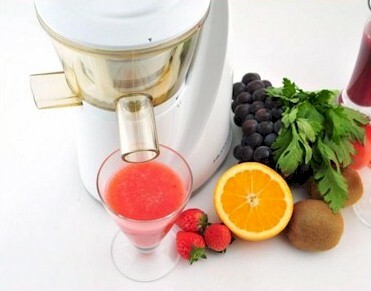 The Hurom Slow Juicer uses a patented Low Speed Technology System (LSTS). It is called a “Slow Juicer” because, like a gear juicer, it operates at only 80 RPM, instead of 3,000~16,000 RPM like a centrifugal juicer. But don’t let the name fool you. It actually extracts juice faster than a centrifugal juicer and expel much drier pulp, with a much higher yield. The maker of Hurom Slow Juicer has improvised on the single-gear juicer and given this juicer an upright build. The auger is fat and roundish (see inset picture), unlike the long auger that we are so used to in other gear juicers. The gear sits nicely in the juicing chamber and does its crushing job efficiently. Before the pulp is being expelled, it gets a second pressing and further squeezed for maximum juice yield. The juice flows out from the spout in front and the pulp on the side. The method of extraction is masticating and pressing (using the screw-like auger). The action tears open the produce’s cell membranes and releases its deep-seated nutrients and enzymes. It also breaks up more of the phytonutrient from the produce, resulting in a richer colored juice which is also richer in its nutrients and minerals. The slow RPM ensures that it does not disrupt the cellular structure of the fruits and vegetables. This eliminates oxidation to the juices, therefore, preserving the precious nutrients and enzymes that are closest to its natural form. 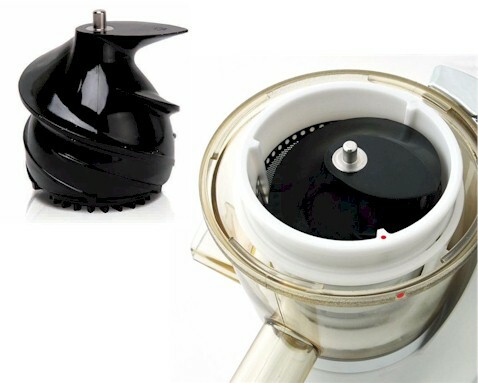 At first glance, the Hurom may look like any other centrifugal juicer and may even be mistaken for one. Unlike other gear juicers, the Hurom is built upright so that it has a smaller footprint and takes up very little space on your kitchen countertop. Construction of this beauty is impressive and solid. All parts are made of non-toxic sturdy material that are easy to maintain. The maker claims that the auger is so hardy, that it is 8x hardier than the auger of original single gear juicer models. You’ll be surprised with just how silent the operation really is, especially if you’re so used to those loud centrifugal juicers. What a wonderful change! The machine is heavy at about 11.5 pounds, which makes it very stable. The weight prevents the juicer from “walking” when in use. There is a handle on the side that allows for easy movement of the heavy unit, making it portable. The large juice strainer has an attachment that is unique in that there are silicon wiper blades that cleans the sides of the juicing bowl. The self-cleaning feature saves you time and make cleaning-up so much easier, at the same time giving a higher juice yield. Whoever would think of that except from the experts!! The feed chute opening is about 2.25″ x 1.25″ so you will need to cut up your fruits lengthwise. For example, cut a cucumber or a carrot lengthwise into four pieces. This saves your preparation time. Although a food pusher is provided, most things you put in will go down by gravity and is self-feeding, effortlessly; so the food pusher is used mostly only when you put in leafy vegetables that would not go down the chute. The feedback for Hurom’s juice yield is encouraging. It is reported to extract almost every drop of juice from anything you put into it. The pulp ejected is so dry, that some say that it’s even drier than other single-gear juicers. I can believe that easily because of the dual-stage juicing where the pulp is given another squeeze to extract every drop of juice. It is possible that the juice yield from the Hurom could be as much as 50% more than that extracted from a centrifugal juicer. That means it’s even higher yield when compared to other single-gear juicers. Simply amazing! If you have never tasted juice extracted from a gear juicer, you will love how sweet and concentrated the juice is from the Hurom. The juice is stable and does not separate because of the enzymes/nutrients that were extracted together with the juice. It may last a few hours if stored properly in the fridge, without getting oxidized (though I still always recommend that you drink your juice immediately). It tastes so delicious and flavorful that you would never want to drink juice extracted from a centrifugal juicer ever again. Believe me, this would give you a new and different outlook on the beauty of juicing. Most sellers claim that there is no foaming/frothing, it is not true. There is foaming, so if you don’t like that you might want to run it through another sieve to remove the foam/froth. Like all well-made gear juicers, the Hurom can greatly help to minimize pesticides and chemicals in your juice. You will save much from not having to buy organic. There are five parts to assembling a Hurom. The package comes with two strainers: Use the one with finer holes if you want less pulp in your juice (tends to froth more); or the one with larger holes if you want more pulp in your juice. This Hurom beauty has an automatic self-cleaning function that saves you time. After juicing a carrot for example, you can pour in a glass of water and let it run and self-clean. Then go on to the next kind of juice, green vegetables for example, so that you don’t mix the color, taste and flavor. Watch how it’s done in the video below. All the parts can be easily taken apart and be rinsed under running water. There are no difficult-to-reach corners. The only part that would require a little more time to wash would be the strainer, with the provided brush. All in all, washing up should take only about 2-3 minutes once you’re familiar with it. It is very important when buying a juicer that it is easy to clean-up. If washing up is a hassle, you would soon give up on juicing. With Hurom, washing up would be such a breeze, it would surely add joy to your juicing experience! Unlike all the other gear juicer, the Hurom Slow Juicer functions mostly just as a juicer. If you want a multi-purpose machine for a lower price, go for the horizontal gear juicer instead. There is no fancy 6-in-1 or 9-in-1 with the Hurom. This video will run for about 11 minutes. Look at how fast the juice from the Hurom fill up, compared to the centrifugal juicer. This is simply because of the higher juice yield. Note how the colors are so rich, they are your phytochemicals, enzymes and nutrients still very well-preserved, enriching the taste and flavor. Also note how cleaning between different colored juices is so easy. You can’t help but just fall in love with this machine. I did.